The Giroux Daguerreotype is described as a very rare model of the world’s first commercially produced camera. The camera was designed and produced in Paris in 1839 by Louis-Jacques-Mande Daguerre and Alphonse Giroux. 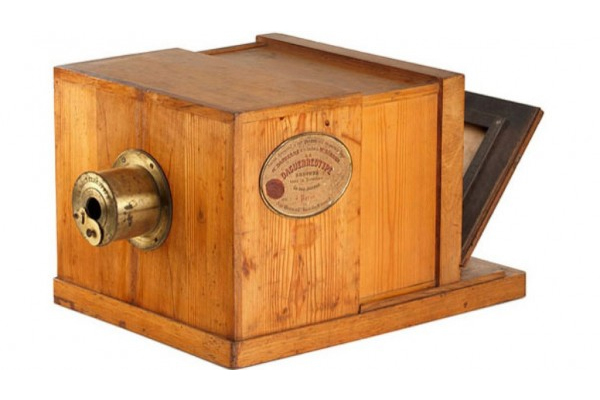 It is one of the only cameras by Daguerre that still exists and is described as being in excellent original condition. There are only a few of these cameras that exist worldwide and most of them are in the possession of public museums. On May 29th the camera is expected to be auctioned in Vienna. The starting price of the auction will be 200,000 Euros. The WestLicht Photographica auction house is in charge of selling the camera and expects the camera to go for as much as 700,000 Euros. The camera has a double box body and the photographer can focus by pulling the smaller box away from the 15inch lens. To bring the camera into focus, the rear box must be moved forwards or backwards along the wooden camera base. Image exposure time is quite long and can take up to three minutes depending on how well lit the image is. Images produces by the Giroux Daguerreotype are finely detailed and practically grain less. The images should also be very durable when framed in a way that excludes air. The cameras are highly sought after as a coveted collectors item. There is also a 24-page instruction manual that comes with the camera, but the user must be able to translate German to understand the manual. The Giroux Daguerreotype doesn’t have any of the updated and advanced technological features of cameras today, but the price of the camera is based on its beauty, originality, and antiquity, instead of whether or not the Giroux has a facial recognition feature.